In a perfect world, we'd all avoid too much credit card debt and would never have to deal with the desperation of being unable to meet our credit card payment obligations. We'd never have creditors hounding us for payment or be worried about late payment fees and credit score damage. We'd never know the frustration of not being able to afford what we really want because every extra cent has to go towards keeping up with the minimum payments on our credit cards. Unfortunately, these distressing situations are the norm for many people. The good news is there are things you can do to put a more positive spin on your finances. Understanding why you spend the way you do is a step in the right direction. When you know the psychology that motivates your financial decisions, it becomes easier to make the right choices with your money. If you're struggling with keeping credit card debt at bay or staying within your monthly buget, here's how to rein in your bad spending habits. An important aspect of debt that isn't always addressed is why you got too deeply into debt in the first place. Why did you keep charging items you couldn't afford? Why did you feel the urge to use those little plastic cards for things that weren't necessary, even when you began to struggle to make the payments? What causes your compulsive shopping or impulse-buying habits? Keeping a spending log and taking note of your moods can help you pinpoint what's behind some of your decision-making. Identifying the triggers that stimulate the urge to splurge can be uncomfortable, but if you don't face them, you may never get control of your spending and your debt. 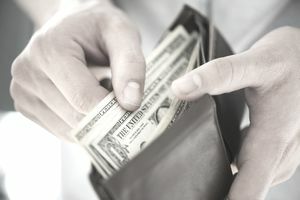 If you're always trying to pay off yesterday's purchases, many of which have long since worn out or been forgotten, you'll have a much harder time trying to plan for financial security tomorrow. One negative aspect of using credit cards instead of cash is that you don't feel like you're spending real money. The pleasant feelings you experience when you purchase the item are disconnected from the unpleasant or painful feelings of making the payment when you get the credit card statement. That disconnect can lead you to overspend on credit, since you don't have to face any financial consequences until later. Putting your credit cards on ice temporarily and using cash,check, or a debit card doesn't afford you that same delayed response. Spending cash can be particularly powerful, since you're actually seeing the money leave your hands. You don't necessarily need to cut up all of your credit cards for good but using cash or your debit card for a month can give you some perspective on how much you're truly spending. Even better, you might consider a no-spend week. With a no-spend week, you commit to only spending money on essential expenses, such as housing, food, utilities and necessary transportation costs. Taking a break from unnecessary spending, even for a few days, can give you a fresh perspective on where your money is going and what you could be doing with it instead. To really get control of your spending and your credit card debt, you need to understand money means to you. That includes how you interact with money and what beliefs and attitudes you have about it. For example, studies also show that people with low self-esteem engage in more impulse spending and buying things they don't need. Your parents' attitudes and behaviors with money growing up can also influence the decisions you make as an adult. If your parents took a lackadaisical approach to managing money and were frequently in debt or behind on bills, those behavior patterns may seem natural or acceptable to you. Recognizing those behavior patterns and where they come from is an important step in breaking them. Remind yourself daily that money or a lack of it doesn't determine who you are. Your worth as a person has nothing to do with how much money you have. Once you truly believe this, and money is no longer connected to your sense of self-worth, you open up the psychological barriers that were keeping you from wisely handling the money you do have and limiting your ability to make more. Right now, your unconscious limiting beliefs may be keeping you from being financially successful, but as you begin to build up your feelings of self-worth and develop a positive attitude about yourself and about money, you'll attract positive things into your life. As you do so, you'll feel less of a need to generate positive feelings by purchasing things, and you'll find it easier to stop buying items you don't really need. There are hundreds of books, magazine articles, and Internet web sites about getting rid of credit card debt. Some of them offer sound advice about the psychological aspects of money and spending that you'd do well to consider. Spending time reading and learning about money is a wise investment. The more you learn, the more apparent the mistakes you're making become and the better positioned you are to create a framework for correcting them. Whether you're reading books, blog or personal finance sites, focus on the actionable takeaways that you can apply to your own spending situation. Credit repair and debt reduction programs can help you get your debt under control, but they may only be so effective if you're not addressing the larger financial issues that got you into debt in the first place. If psychological factors influence your spending, credit reduction programs are like using perfume to cover body odor: they will treat only the symptoms, not the root cause. Working on the psychological aspects while taking steps to reduce debt will greatly increase your chances of long-term success.